Awareness and effective antibiotics can save your life, too. September is Sepsis Awareness Month. Here are key warning signs. Seven years ago this December, I fought for my life in the ICU, battling a sudden infection that had turned into septic shock within a matter of mere hours. Sepsis, the body’s life-threatening response to any infection, requires the rapid administration of antibiotics and fluids. One study shows that the risk of dying from sepsis rises by as much as 8 percent with every hour that passes before treatment begins. The question of whether I would live or die would be determined by two factors: the speed of the medical response and the efficacy of the antibiotics used to treat my infection. The medical team at my local hospital responded with urgency. A central line was promptly inserted in my neck, delivering vasopressors to sustain my blood pressure and keep me alive. Meanwhile, other IVs delivered a range of antibiotics in the hopes that one of them would work to eliminate the infection. Sepsis is an emergency, just like a heart attack or a stroke. In order to obtain rapid treatment, however, patients and healthcare providers must first suspect sepsis, which makes awareness so important. More than 40% of U.S. adults have not heard of sepsis, according to a 2017 awareness survey by Sepsis Alliance. This lack of awareness can contribute to life-threatening delays in emergency care. That’s why Sepsis Alliance, the nation’s leading sepsis advocacy organization, declared September as Sepsis Awareness Month. Raising awareness saves lives from sepsis. The fact that awareness saves lives is a modern luxury, however. This luxury is afforded to us by one of the greatest medical discoveries of the 20th century —antibiotics. Before the discovery of penicillin just 90 years ago in 1928, routine illnesses like strep throat, regular life events like childbirth and common injuries such as skinned knees routinely led to deadly infections. This September, CDC is introducing a new initiative, The AMR (Antimicrobial Resistance) Challenge, which takes a global approach to combating the problem of antibiotic resistance. Launching at the United Nations, The AMR Challenge asks for commitments for global actions to improve antibiotic use, as well as improve infection prevention and control, environment and sanitation, data and tracking, and vaccine/therapeutic/diagnostics. 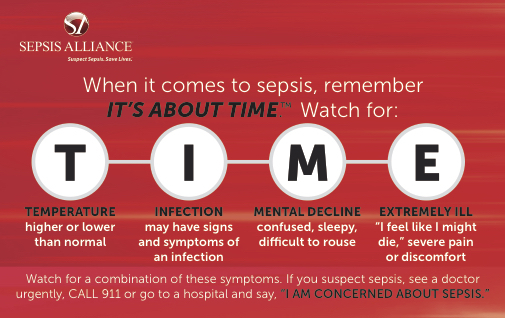 I believe the timing of the campaign, which runs from September 2018 to September 2019, is perfect because it coincides with Sepsis Awareness Month. It is essential to understand why it’s so important to preserve antibiotics. We’re not saving antibiotics for stuffy noses, viruses or use on factory farms. We’re saving these powerful drugs so that they can treat potentially deadly infections, saving the lives of those patients who need them the most. Looking back at my own battle with sepsis, I realize that, in addition to awareness and effective antibiotics, there was a third factor that was responsible for my survival. That additional factor was a photograph of my two young sons, which my husband had placed by my bedside. As I drifted in and out of wakefulness in the ICU, I focused on that image, determined to fight for my life so I could be there for my boys. I am so grateful that my local ER suspected sepsis and that the antibiotics they used to treat me worked. Because I received prompt and effective treatment, I’ve been blessed with the ability to be here for my family. Today, with awareness and effective treatment, we can save lives from sepsis, one of the deadliest conditions facing humanity. We owe it to our children to raise sepsis awareness and ensure antibiotics continue to be effective for future generations. Dana Mirman is a publicist, writer and former TV producer. She is a member of the Board of Directors of Sepsis Alliance, and is an advocate with Pew Charitable Trusts' Supermoms Against Superbugs initiative.